Around the world, money talks. In some places, it speaks in a whisper; in others, it is like your humble correspondent at a party after one too many dark and stoney’s – loud and obnoxious. And in Kenya, many, if not all, businesses, will at some point find themselves deciding whether or makes financial sense to pay a bribe. Corruption is not a third world vice. There are enough Swiss bank accounts and shell companies in the Cayman Islands to provide evidence for first-world malfeasance. This corruption, while destructive, is difficult to identify, because it is built into the infrastructure of the system. It is a tax code that makes no sense except to people who understand how to take advantage of it. But in some places – Kenya being one of them – corruption is in-your-face. At every turn, you might be asked for a bribe. Police set up roadblocks simply to collect “something small” from drivers. Ministers exact rent from anyone seeking to do business in their districts. From the lowest traffic cop to the highest levels of government, corruption is rife. For companies, dealing with corruption is a very real part of doing business. The system – particularly within the government – moves slowly, and sometimes not at all. A work visa could take two weeks or two years to process, depending on who you know and, more importantly, who you pay. If you are a vendor trying to buy a storefront, obtaining a construction permit means putting 2,000 Kenyan shillings in an envelope to “expedite the process.” To be sure, greasing the gears of the system leads them to move more quickly. But doing so exacerbates the problem, providing positive reinforcement to those collecting bribes. And once a company is identified as one that pays bribes, there is no end to the gravy train. Once they have paid a bribe somewhere, companies operating in multiple cities or provinces will have to pay the same tax everywhere. The question then becomes, is it worth paying a bribe to make doing business easier? 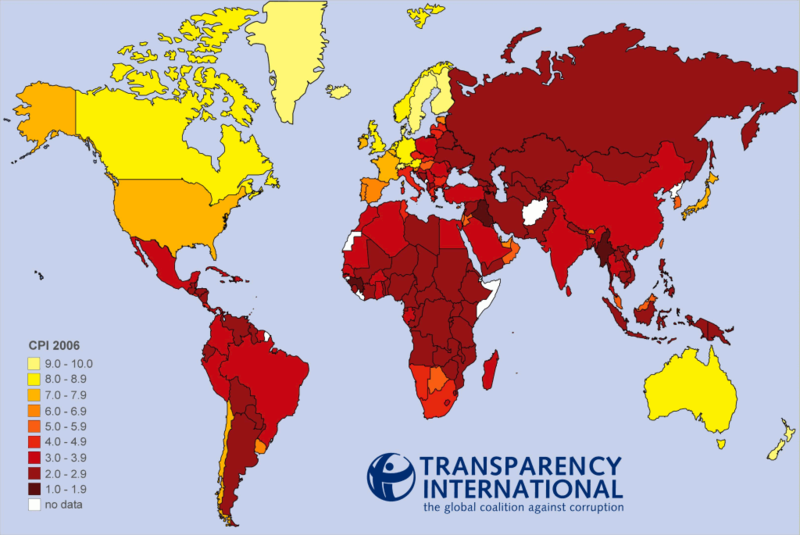 Transparency International's Corruption Perceptions Index. There are some, including Develop Economies, who have made that claim in the past. Why not? After all, civil servants are underpaid. Their superiors extract money from them, and on up the chain. Not to mention, placing restrictions on American companies through the Foreign Corrupt Practices Act (FCPA) only puts the U.S. at a disadvantage when competing against companies from nations with no such regulations. But that, unfortunately, is not the truth. Corruption is a parasite, feeding on society, preventing it from making forward progress. Businesses that are bled dry from corrupt entities will cease to make investments in growth and expansion, as they are increasingly less rewarded for risks. Roads and bridges that allow commerce are rarely built. When they are eventually constructed, they work is so shoddy that it falls apart during the next heavy rainfall. This, of course, is good for the contractor, who also happens to be the minister who commissioned the road to be built in the first place. For multinational businesses, paying bribes is part of the expansion process. And with the BRIC countries – three of which (India, China, and Russia) happen to be among the most corrupt in the world – accounting for much of the growth in this post-Western global economy, gaining access to the billions of people in these fledgling economies means paying bribes. Among the guilty are some of the world’s largest corporations. The scandal tells you that doing business in the world’s fastest-growing markets can be fraught with peril. Emerging markets now account for the bulk of the world’s economic growth, as well as about 30% to 60% of the revenues at many U.S. multinational firms. Indeed, one of the reasons that the stock market has done relatively well throughout the downturn is that it was buoyed by U.S. multinationals earning more and more of their money in these still relatively fast-growing economies. This is particularly true of packaged-goods and retail firms like Walmart. Many of these markets are rife with corruption–but graft is not necessarily perceived as a serious crime in some places. It’s more a way of doing business. In Mexico, “the bulk of retailers pay bribes,” says one veteran Mexican fund manager for a large U.S. financial institution. Indeed, Mexican firms are the third most likely to have to pay bribes, right after Russian and Chinese ones, according to Transparency International, an anticorruption NGO. If that is the case, then how can these multi-national firms enter these markets without playing (or not playing, depending on whose side you are on) by the rules? Dealing with governments where corruption is endemic pose a fundamental challenge to doing business in developing countries. But the truth is that buying into that system – stock price aside – will only make it worse. Once a company has established itself as one that is willing to play the game, there is no end. It is difficult, but abstaining and refusing to pay will be better for the business in the long-run. There are ways around the system. The courts, as corrupt as they may be, can be an avenue for justice. But unfortunately, when time is money, patience can be a financial burden on the business. Still, paying a bribe will be only cause more problems for a business in the future. Josh, do you know any examples where race-to-the-bottom self-reinforcing systems like these were turned around? Is it just a few people taking a stand and being loud about it until people are shamed into changing?